To his surprise, I asked him to clarify this chivalry of his. I'm not quite sure why I kept the conversation going. This stank like a scam, besides, I need to send 1 SBD to this guy's account so he can later upvote my stuff. Seems like a lottery, with the difference that someone guarantees that you'll win. It's clearly a scam. I tried to make him explain why the 1 SBD (I couldn't get to a straight answer), while at the same time checking his transfer history, and he's making, what seemed to me, a ton of transactions at the moment of our conversation. Somehow this made me believe he is legit, and that he'd help out sometimes. Of course, I never took the amount literally, but I've been playing around with some of those upvoting bots and thought this could work in a similar fashion, a little boost can't hurt. What could be the reason he did this, as I really fail to see any significant benefit that he may have. But then again, I'm quite illiterate when it comes to understanding all this decentralized-crypto feature of the www. For now. Also, I'm not sure if I should - and how to - contact this person and ask for some clarifications? So sorry that happened, but at least there's a lesson. A friend almost got scammed as well. Someone pretending to be xaero1, saying gonna delegate huge, but just to send him a steem/sbd first. Lesson definitely learned :) I wasn't sure whether to expose his name, so I'll do it here. The user is @lifewordmission, but he told me to send the SBD on his other account, @blocktrades, so people can recognize it. Ok, so you mean they can provide a fake name even for a SBD transfer? That definitely looks like a scam. As to what s/he has to gain, think of this way: If s/he can scam 20 people into send him/her 1SBD, then s/he’s made off with 20 SBD s/he can cash out and jump to a new username to begin all over again. 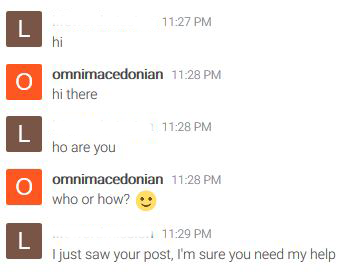 Well done @omnimacedonian! You successfully guessed the match result. Hello. The contest steembord inspired me to hold my charity. I want to give three lucky football souvenirs from Russia. I do not have the means for active advertising. I really want to give gifts to my new friends from steemit so I write such messages. Thank you for any help in distributing this information.